Here's the reviewer test kit, with full test results coming March 2. Last week, AMD showed Ryzen to the world, with a limited selection of benchmarks and official specs and pricing. Everyone wants to know how Ryzen will perform in a larger test suite, and rest assured I'm doing my part to be ready for the unveiling. AMD seeded press and industry analysts with hardware at the event. Here's a peek at what we received, along with features and other interesting details. I can't talk benchmarks yet, but this is easily the most exciting AMD processor launch in more than a decade. There's an incredible amount of hype to go along with the performance preview AMD gave last week, but outside of the processor it's also great to see a modernized platform—socket AM3 is eight years old, and the slightly newer AM3+ is still six years old, a virtual eternity in the fast-paced world of technology. 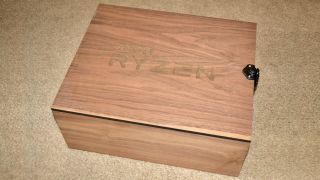 AMD shipping everything in a rather nice wooden box, emblazoned with the Ryzen logo. Well, not quite everything as the Noctua cooler came in a separate box. I was a bit disappointed that there wasn't a CLC (closed-loop liquid cooling) solution, but I think AMD wants to ensure there's no assumption that Ryzen will require liquid cooling to run properly. The CPU is of course AMD's top Ryzen 7 1800X part, a $500 chip intended to go toe-to-toe with Intel's i7-6900K at less than half the price. This is an 8-core/16-thread part clocked at 3.6-4.0GHz, with 16MB L3 cache and a 95W TDP. That TDP is particularly important, as it's 45W lower than Intel's TDP for their X99 enthusiast processors. Unlike Intel's X99 platform, Ryzen uses a dual-channel memory configuration, which also allows AMD to get by with far fewer pins on their CPU socket—Ryzen uses 1331 pins compared to 2011 for Intel's 6900K, and 1151 pins for the 'mainstream' platform (ie, i7-7700K and other Kaby Lake/Skylake parts). The extra pins on Ryzen presumably allow for a dedicated NVMe x4 PCIe slot, plus USB3.1 and a few other tidbits. AMD sampled press one of three motherboards, with mine being the Asus Crosshair VI Hero. Other than the CPU socket and a few other identifying markers, this could easily be mistaken for one of Asus's Z270 boards. It comes with three x16 PCIe slots, three x1 PCIe slots, eight SATA ports, internal USB3.0 and 3.1 headers, RGB LED lighting, a POST code LED readout, onboard power switch, and five 4-pin fan headers. The board also features high-end Nichicon capacitors for the audio and CPU power circuitry. As the name implies, this is Asus's current top-tier AM4 motherboard, at least for the time being. The rear IO panel includes two USB3.1 ports (one Type-C), eight USB3.0 ports, four USB2.0 ports, Gigabit Ethernet, audio jacks, and BIOS and CMOS buttons. Since this particular board is designed for the initial Ryzen processors, there are no video ports, which is sort of interesting as future APUs will also work in socket AM4. This is something I've noticed on most (all?) of the initial AM4 motherboards, so there will be a second round of boards for users that want to use a Ryzen APU later this year. One thing I want to point out for the Crosshair VI Hero is that Asus includes a small front panel adapter that aids tremendously when it comes time to wire up the case's power, reset, and power/HDD LEDs. This is often one of the most finicky aspects of assembling a new PC, particularly for inexperienced builders. Every case and motherboard seem to prefer a slightly different arrangement of the pins and connectors (or at least, it's not fully standardized), but this handy little adapter allows you to connect everything outside of the case, and then plug it into the motherboard. Easy! More boards should definitely include this little extra. Last up, Ryzen supports a wide range of DDR4 memory, with official support up to DDR4-2667—though unofficial support as usual goes quite a bit higher. For the review kit, AMD provided 16GB of Corsair Vengeance LPX DDR4-3000 RAM with 15-17-17-37 timings. Faster RAM might improve performance a few percent on average compared to slower DDR4, but typically it's better to put money into a faster graphics card or other components first. I've also got the Ryzen 1700X and 1700 parts for review, and the latter could steal the show given its extremely low price and potential for overclocking. Testing is well underway, but check back Friday morning for the full review.